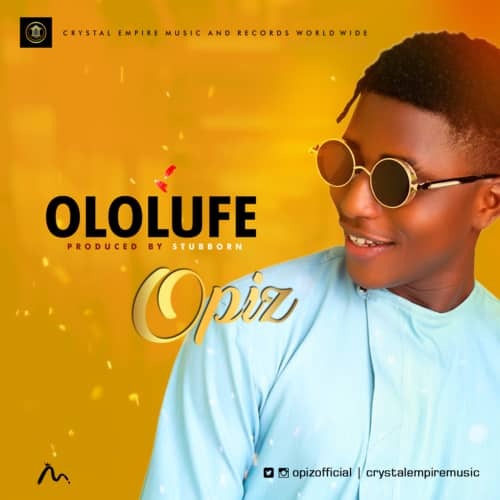 Crystal Empire Music & Records Worldwide is proud to release the debut single of their newly signed talented afro-pop singer “OPIZ” the song titled “OLOLUFE” is a super hit song which cut across all event turn ups for the celebration of lovers. The song produced by the label newly signed producer “STUBBORN” is a good introduction for the singer. OPIZ whose real name is OSAYAMEN PRECIOUS is an Afro-pop singer who hails from Benin City, Edo State in Nigeria. Describing his debut single, OLOLUFE as an expressive lyrics carefully selected for his fans and also to show how much he loves his music. Commenting on the newly signed artiste, CEMRW Ceo, “Calipha” said: ‘OPIZ’ is a formidable force to look out for in the entertainment industry. Also knowing that Crystal Empire Music and Records Worldwide won’t stop at anything to fulfil the dreams and aspirations of the talented upcoming artiste in Nigeria and the world at large.